I even wanted this hair! So flippy! Oh Nancy, how I loved you! You had gal pals named Bess and George. (A girl named George, how groovy!) You had Ned, the adoring boyfriend. (A college man) You were fussed over by Hannah, your loving but stern housekeeper. I thought you were terribly glamorous and smart. I wanted to be you. So. Bad. 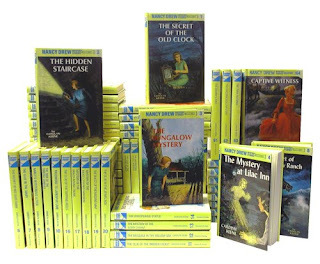 The Nancy Drew books will always remind me of home. They (and the Trixie Belden books) were the first series I ever read and probably the first books I read that didn't have little golden spines and 5 words per page. When I think of these books I can almost smell the house I grew up in. Man, I miss that place. Thanks to my mom and her sisters for passing down these gems to me! 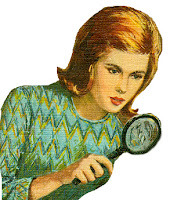 I just adore Nancy Drew! Some of my best 4th grade memories were of reading through the series with my best friend. I also loved the Enid Blyton detective type stories - Famous Five and Secret Seven. I had them and my Nancys all lined up on my bookshelf and they were certainly well read! I never had a chance to read Enid Blyton and that makes me a bit sad! For some people, scents or the taste of certain foods will take them back to their childhoods. For me, it's books. Especially picture books. Before I was able to read, I stared at the drawings in books while they were read to me and I can still "see" some of them in my head! Adrian, I love hearing that because I know just what you mean! Oh, man! For me it was visiting my sort-of Grandma's house. Her basement was lined with bookshelves of all the great girl series like Anne and Ruth Fielding and Marjorie Dean. The basement was a little damp and musty, but quiet and safe all at the same time. I loved my visits to that house. Re-reading Anne or Marjorie brings me right back to that basement and all the promise that it held. Somehow, I missed reading Nancy Drew when growing up :s My childhood reads were Sweet Valley High and Roald Dahl, among others. I think the Winnie the Pooh books (and animated show :)) really remind me most of home and my childhood. Ah, SVH, I liked those a lot too. I wasn't introduced to Roald Dahl until my kids were born..I wish I had had access to his books when I was a kid! Am I terrible for never having read any of these books ever???? I read a ton as a child, but never a Nancy! Nah, not terrible! I was just lucky that the whole series was still around from when my mom and her sisters read them.